Cadmus is arming crooks with alien weaponry leveling the playing field with Supergirl. Caught in the crossfire is James Olsen. No superpowers, no special armor or weapons of his own, he feels powerless but wants to help make a difference. See how Monday's episode of Supergirl, "Crossfire," becomes the catalyst for Olsen to become the Guardian. The first promo from the CW is presented by executive producer Ali Adler. She explains Olsen's motivation to become more than a sidekick and help as a hero himself. Tired of playing second fiddle to Superman in Metropolis and now Supergirl in National City, Olsen confides in Winn that he's determined to step up and join the fight. The second promo is the full preview clip from the episode where Supergirl battles a gun-toting thief as she tries to stop a bank heist. She realizes she's up against more than she bargained for. Supergirl airs on Monday at 8:00 pm on The CW. 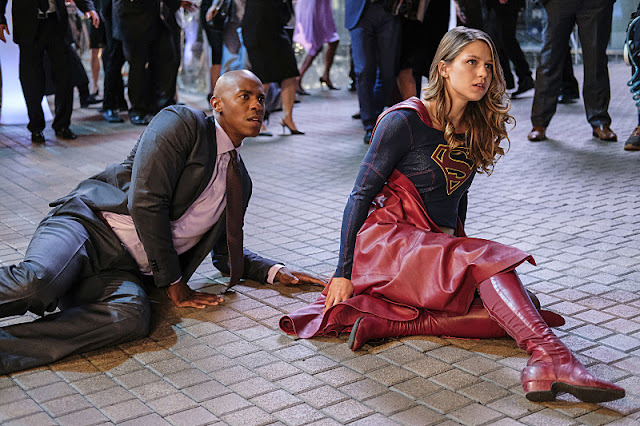 Supergirl 2x05 "Crossfire" Inside Season 2 Episode 5 - Supergirl (Melissa Benoist) must beat a ruthless new gang who has been armed with dangerous new alien technology. When Cadmus sends a video to the DEO, the team realizes Cadmus is the one staffing the criminals for a secret mission. Meanwhile, Kara (Melissa Benoist) gets Mon-El (Chris Wood) a job as an intern at CatCo, James makes an important decision and Lena (Katie McGrath) invites Kara to attend one her fundraisers. Glen Winter directed the episode written by Gabriel Llanas & Anna Musky-Goldwyn (#205). Original airdate 11/7/2016.